What is the best home defense gun? You remember the 3 types of guns—pistol, rifle, shotgun. We’ll go through each covering the pros and cons. Rifles will usually pack plenty of power even with standard FMJ bullets, but they are long guns that can be unwieldy in tight quarters. An intruder can grab the long barrel with leverage if they get close enough. If you decide to go with a rifle, you must be sure that you can take care of the threat long before they get close to you. There’s also the potential of going to court for your use of a firearm for defensive purposes. The jury is likely to view your AR-15 as a super deadly “assault rifle” rather than the most popular sporting rifle with very controllable recoil. Rifles will also usually have a high magazine capacity such as 30 rounds for the AR-15 in free states and 10 rounds for restricted states. But, semi-automatic rifles can jam and require a decent amount of training to use and clear jams. For the reasons above, we recommend not going with a rifle for your home defense needs. But if you do, ammo choice is critical since the FMJ rounds mentioned will usually go through walls and keep on going. Ammo designed for expansion such as hollow points or ballistic tips will lower the risk of hurting loved ones in other rooms or neighbors. See our in-depth recommendations of Rifles for Beginners or jump into our AR-15 Buyer’s Guide. You’ve heard it everywhere, shotguns are the best for home defense because of their spread, ka-chunk sound, and stopping power. But, a few things to keep in mind. Shotguns are long guns as well. However, you can get shorter barrels along the lines of 18″ which make them more agile in close quarters. But it is still long enough for an intruder to grab and rip away. Pistol grips take off a lot of inches but make it a lot harder to shoot. The spread of shotguns are also depicted as a magical wall of destruction. 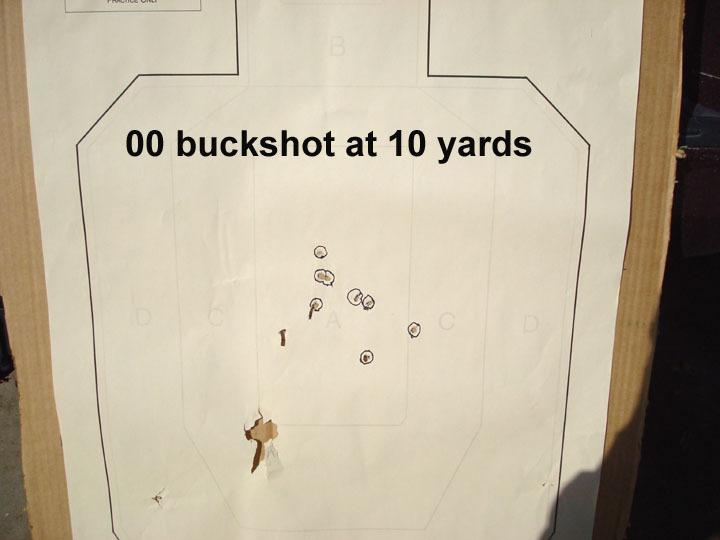 However, one instance of spread at 10 yards using 00 buckshot is shown below. You still need to aim pretty well with a shotgun to hit a human sized target! Then there’s the “ka-chunk” sound of racking the slide in a pump shotgun. There’s two sides to this argument. First, some believe the sound will scare off all but the most determined of criminals. Second, some believe that you shouldn’t give away your position. The jury is still out on this one for us. One thing we are sure of, is the stopping power and reliability of the shotgun. Ammunition choice is again key for home defense. Most recommendations would skew towards 00 buckshot for houses or Number 4 Buckshot if you are in thinner walled accommodations such as mobile homes or apartments. See our in-depth recommendations of shotguns for beginners & home defense. Handguns are small and easily stored to be readily on hand at home. They have less of a chance to be taken away in a struggle. And although it wouldn’t be the first thing on your mind, pistol rounds will damage your property less in the aftermath compared to a shotgun blast. The choice then boils down to semi-automatic modern handguns or revolvers. Modern handguns come in all calibers which when paired with hollow point bullets will be plenty powerful to stop intruders. They can usually carry more ammunition in their magazine compared to revolvers (a 9mm Glock 17 holds 17 rounds while a 9mm Beretta 92FS holds 15). Even if you are in a magazine restricted state, you can usually have 10 rounds. Compare that to 5/6/7 in a typical revolver. The reload times are also magnitudes faster if you have extra magazines. However, they are more prone to jamming and are somewhat ammunition sensitive. This can be mitigated with good upkeep, practice, and testing with defense rounds. Revolvers are easy to use since there are no external safeties. If there’s a jam or a round doesn’t fire, you just press the trigger again to cycle the cylinder and shoot the next round. This makes it especially easy for your other family members to use. Revolvers can also sit ready to go for years because all the springs are in a relaxed state when loaded. And they are not very ammunition sensitive. See our in-depth reviews of the best handguns for beginners & home defense. Or already have one? Learn how to shoot it more accurately. Or…are you starting out brand new? If so, check out our Gun Noob to Gun Slinger beginner handgun video course. Everything you need even if you don’t have ANY experience with guns. The best advice here is not to just go out and get something in the biggest caliber. Big holes behind the bad guy are not as useful as tinier holes in them. You want something that you can control easily and that is affordable enough to practice on a regular basis. 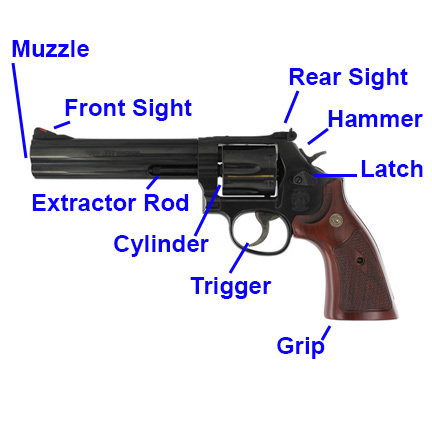 Here are some suggestions for the different types of guns. And be sure to check out our suggestion at our Ammo & Reloading section. 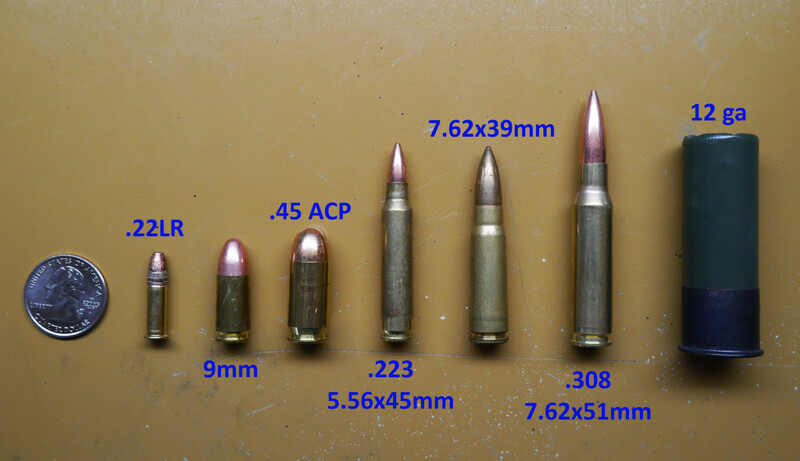 You’ll probably go with something in the .223/5.56 such as the AR-15. Be sure to get something that is specifically for home defense such as Hornady TAP. Covered above, but a good rule of thumb is 00 buckshot for homes and number 4 buckshot for mobile homes and apartments. Birdshot is not very effective. A lot more choices such as 9mm, .40 S&W, and .45 ACP. Be sure again to get hollow point rounds that work in your gun. Good examples include Speer Gold Dot and Federal Hydrashok. Again, a good amount of choices such as .38 Special or more powerful .357 and .44 magnums. Also be sure to pick up defense rounds such as Speer Gold Dots. We’re in the age where there’s almost too many choices of things to bolt onto our guns. But we’ll help you keep it simple. Most confrontations take place at night so we would recommend having some sort of light source on your gun. There are tons of flashlights & lasers that mount onto your guns. 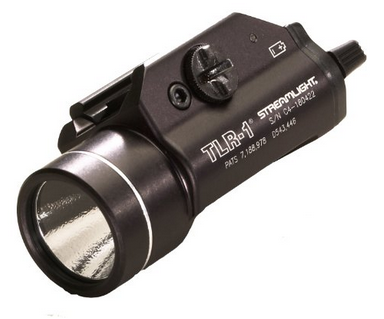 Our go-to is the Streamlight TLR-1 ($110). We also highly recommend having night sights on your handguns. 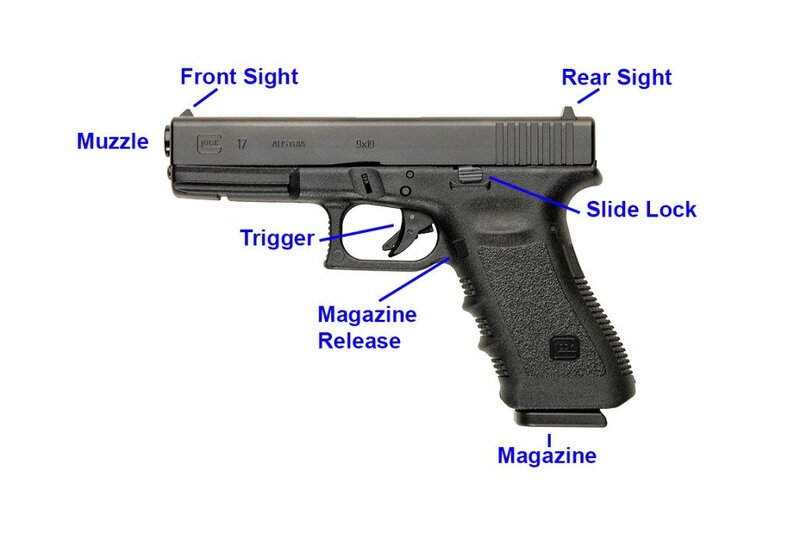 Night sights are also known as “tritium sights” since the sights have built-in vials of radioactive tritium that glow in the dark with a half-life of 5 years. After a pistol class with a night segment, I have both tritium sights and a flashlight/laser combo. It was just so difficult without them. This article gets a lot of information in, but we highly recommend the book “Deadly Force” by Massad Ayoob. 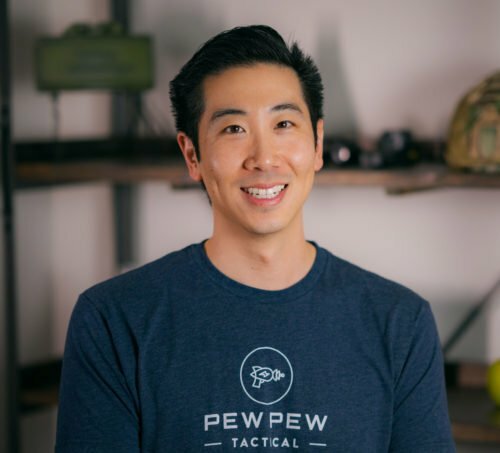 He’s known as one of the best firearms instructors, decorated competitive marksman, and expert witness for self defense cases. How do you feel about a Taurus ‘Judge’ for Home defense. I personally wouldn’t use it…410 isn’t that great for self-defense. What are your reasons for not liking a .410? thankyou for to share all these magnificent information, great for begginers like me.